Last week I mentioned the use of color and placement as key factors when it comes to increasing your click-through and conversion rates. As well as getting more visibility & opt-ins from your email subscription form. *Note - the price has dramatically reduced from $49.95 to only $9.95 and the Color Psychology guide is now separate - but both are cheaper together than the original deal! Lately I've been looking less at new methods to increase traffic & revenue, and more at leveraging what I already have in place. Meaning a few simple tweaks instead of a new marketing strategy or investing time in creation. So "more money in less time" basically. Which is ideal, of course! What Michael Did Here Is Insane! If you're familiar with the term "heat map" then you know it has to do with "eye pull", or where the eye is drawn on any given web page. This is one of the key elements I examine when I do blog and website reviews. Using a combination of strategic placement and color, you can compel your visitors to focus on specific elements of your page - which will increase clicks, sign-ups and conversions... dramatically. Michael went through years worth of usability data, tested more than 50 layouts and templates, extensively split tested 2-column vs 3-column layouts, and tested a variety of ad types & sizes to see which performed best in which positions. The result is detailed data on both usability AND ad performance, with the goal being a comfortable combination of the two. Keeping visitors engaged on your page longer, which improves your search engine rankings, while also increasing revenue. Let's be honest: we all hate testing and split-testing and testing some more. It's time-intensive *work* with complicated software & tools. Fortunately Michael and his team have already done all the work for us! And don't worry - the guide is not at all geeky or dry. It's very well written with many helpful illustrations, so even a novice can understand and apply all of the actionable tips! You'll discover the three ad sizes that are proven to perform best, which ad types work best in the footer area of your pages, and which positions are considered "banner blindness areas" and don't perform well at all. He walks you through multiple templates and layouts, showing you what worked best on each of them - and why. You even get the top performing templates as part of the package, along with blank ad templates to create your own ads - great if you are advertising, or need ad units for your own affiliate program. And at the end of the guide, and appendix of successful ad samples, which should prove helpful when selecting ads to display or creating your own. Hundreds of hours went into this report as well, with the main goal being the answer to this one simple question: "How does color affect the emotion, and influence the purchasing decision of my viewers?" The coolest part of this guide, in my opinion, is that Michael tells you exactly which colors to use to sell which products. And yes, there's a science to it! What you'll read in this Color Psychology guide is not theory or opinions. It's based on fact, science, research, polls and tests. Have you implemented anything out of the book yourself yet? It would be cool to know what changes you make and what kind of effect they have. I just read it the same morning I shared the review (yesterday), so I don't have any results to share yet. I look forward to implementing what I've learned though. Very exciting stuff! Thanks for the great review, Lynn! I can't wait to dig into this - great information for the client work we do, plus I've been on a mission to improve my Advertising income across each of my own sites. Ditto - we'll have to stay in touch and compare notes! Well first I have to know WHAT I'm selling and therein lies my challenge. You would think that with a downsizing, simplifying, small house/live large site, there would be tons of options. I have never had such a quandary with figuring out monetizing as I do with this site. Just as an example, I opened up my Amazon account to find I had 3 or 4 sales.. Can't remember now.. but I was all excited until I saw my HUGE commission of 16 cents!! p.s. and yes, I am going to offer ebooks even tho the going ebook rate in my niche seems to be about a dollar or two. another p.s. and the frustrating part is I'm getting TONS of rapidly growing traffic. Yes.. I forgot to mention that I do have a bit of Adsense and am making a wee bit there. I think I got spoiled because most of my previous sites got traffic from people at the end of buying cycle.. and so the click thru rate (and buying) was super high. I will say for anyone new just now thinking about their niche.. do consider how far along people are in the buying cycle when they land on your site. I can personally vouch for the difference being $1000's of dollars of income per month versus a $100. for the same traffic. just something to think about. I hope Lynn doesn't mind me jumping in here to help. But what you're facing has to be the number one thing I helped people with in my decade of coaching. So you're not alone in trying to figure out what to sell. After 25 years in marketing and advertising, I've boiled it down to a sentence. Sell the end result you want the person to have and the consumables to get them there. You're not selling downsizing your home. What you are selling is security, simplicity, ideas, tips, less burden and clutter, in short a lifestyle. A happier, simpler life. You could even use that as the call to action on your newsletter sign up. Instead of saying, Get Weekly Magazine that you have now, try something like... Discover how you can have a happier, simpler life with our weekly ezine. Also, the most missing element is the human element. You have no photos of happy smiling people - due to the lifestyle change - on your home page. I see an ocean view, the back of a guys head, and the back of a woman's head. Turn those photos round so we can see the smiling faces. And put the man and woman together. You're selling happiness remember? Ok, as for the consumables I believe in math, stats and research. Stats Canada says due to the economy, people are cocooning more. Home entertaining is way up. Sales of patio furniture up 5% last year and expected to rise again this year. Join some affiliate programs and sell patio furniture, BBQs, gazebo blueprints, home improvement stuff, and all the consumables for home entertaining. That's where the money is in your market. Oh, and while your at it, put your newsletter sign up and your ads on the left, instead of the right. 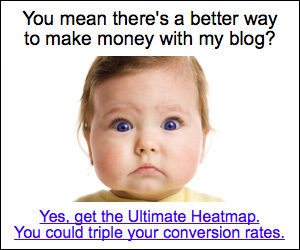 My Ultimate Heatmap research concludes that you'll get at least 30% more sign ups if you do. And that's your true business asset. Permission based email marketing, to those who have asked you to send them something. Appreciate you taking so much time to write out your thoughts. And that's so funny (not) about both the woman and man turning away from the camera. I never thought about that before. Awesome stuff, Michael - and great advice for EVERYone to read! Absolutely fantastic advice! I know I definitely learned a few things. I love Michael's suggestion about patio furniture, etc. Those are big ticket items. Another suggestion, which is more legwork, but potentially very lucrative, is to approach small home builders and enter into an exclusive referral arrangement with them where you earn money for leads and/or sales. Leads are easier to track (get your own toll free number and add up the calls and conact forms completed). Sales require trusting the merchant. I do this with some merchants and I hired a call center to intercept calls collecting names and phone numbers before forwarding to the merchant. Small homes, although small, still cost a lot of money to build. Even small percentages on the sale could be big dollars. Anyway, since 2011 I've set up several exclusive referral deals with global and local businesses. It's worked out very well. I have no affiliate competition and I can negotiate high commissions/leads. Thank you Lynn for sharing and always you give a true review of what you think is good. I have always used whatever you said. I am going for it. As always having been a visual person I hear ya. This is more of a science than an art and way more than hocus-pocus. Should be fascinating subject and one that could put the "action" in the "call to action". Should I? Shouldn't I? Of course I should! If only the Canadian $ was just a little bit higher. The $10.00 discount should more than compensate for the slight dip today. I hope you are having an AWESOME heat mapped and colorful day! Was just on your Brainstorming hour and after the great review on my website and your suggestion about getting Website Heat Map and Color Psychology I'm ordering it now. Can't wait to dive into it. As always, thanks for your great tips and sharing your knowledge. That was a fun session - thanks for putting your site up for review! 🙂 I look forward to hearing your thoughts on Ultimate Heatmap and Color Persuasion. I am learning more every time I go back over them! I always like color and I think it's fun to color coordinate your site. Thanks for the tip Lynn! I just wanted to stop by and say thank you for reviewing the Ultimate Heatmap and its companion, Color Persuasion. I appreciate you and all the work you put into it. You really nailed it when you said at the beginning of the review, "Lately I’ve been looking less at new methods to increase traffic & revenue, and more at leveraging what I already have in place. That's exactly what this product - the result of years of research - was designed to do. Everyone thinks traffic is the holy grail. It's important yes, but converting that traffic, or getting it to take your desired course of action is ultimately what you're after. Almost everyone who modifies their layout to one of the Ultimate ones, increases action. Doesn't matter if it's signups, requests, donations, sales, or even test drives. Sometimes it's the simplest ideas that can bring the greatest change. After all, mighty doors swing on tiny hinges. All I ask is that people try it out. If it doesn't work out, there's a 60 day guarantee. Just try it, even if it's something as fundamental as putting your sidebar on the left, instead of the right. Just that simple change can bring at least 15 - 30% more action. Thank you Lynn for helping me spread awareness of this research. I hope it helps your readers as much as it has helped mine. I was floored at the amount of research and science that went into these guides. Even more so that it was so well-written that anyone can understand and apply the actionable advice, including the non-geek readers. I expected it to be more technical, but you did a fabulous job breaking it down. p.s. Thanks again for the awesome discount. You rock! Thanks Michael and Lynn for arranging this discount, I just bought it. Before I bought it, though, I decided to flip my right sidebar over to the left side and see what I think (gotta love the Builder theme for making that so easy to do). I kinda like it even though I have no idea why it's better! I think we all got our money's worth from this single entry. I'm going to switch my sidebar alignment. Thanks Michael. I'll go check out your book. I have thousands of posts and plenty of traffic. It's time to do more with that traffic!! Great Stuff Lynn!Just got it, can't wait to learn lots. Hi Lynn! Awesome review, and it's good to see Michael's comments too. Just wondering, are you done tweaking? This is really intriguing! I am not done tweaking, no - starting with notes and an action plan. I was out most of the day today filing my taxes (yay rah - lol) and so I'll be working on implementation over the next week or so. I'm stoked to make some changes and keep an eye on the results! "looking less at new methods and more at leveraging what I already have in place.." I definitely agree with this, Lynn. Sometimes, we need to master or maximize the resources that we already have. I believe we can be most efficient in this manner. Thanks for sharing the Ultimate Heatmap. I really have to read and learn more to improve the design and layout of my site. If we go for the good advertising strategies,our visitor will change into customer. Always try to catch the visitors with psychological tactics and this post is mile stone in this regard. Your comments have sold me on your book Michael, going get it and try out your layout ideas. Actually after that comment, stayed up all night reading the book and making the book's changes on one of my sites. Will post the results when I find out. Good stuff, hey? 😉 I look forward to hearing about your results! Michael Campbell, I was in two minds whether to get your book or just let it a go but reading the comments ... decided to go ahead and learn your stuff. Definitely, I going to change my sidebar position and others. I've been doing a lot of A/B-split testing in my life and I'd love a way to get past it but I'm actually not sure I'd trust simple guides. The thing is that all sites work different and I haven't been able to see any quick fixes yet. I'd recommend you still test, but this is far more than a simple guide. Tons of research and split testing went into the results shared, with a combination of variables. All of which Michael shares in great detail. Hi Lynn. Missed the last two brainstorming hours since I've been on vacation but it sounds like you've been busy. I've been thinking about how I could tweak my plr site a bit and it sounds like this book has some great ides. I'll have to take a look. Question- is there info on how to do the changes as an A/B test or are you just going ahead and implementing the changes? You can use Google Optimizer to split test. Some things such as ad placement for example I'm just implementing straight off. I'll be able to tell if it results in increased clicks/revenue in my stats of course. Thanks Lynn and Michael. I was vaguely aware of the psychology of color but have never looked enough into it other than ' "I think I like this color." The research and stats behind it will appeal to me. It sounds like finding ways to change what you are doing with your current list is what others are doing as well. Thanks Lynn for all of you cool stuff. Guess what! I was holding off buying because I've very short of cash at the moment but... because Michael was gracious enough to come on here and leave such valuable comments and give us some of his expert advice ... I've purchased it too! 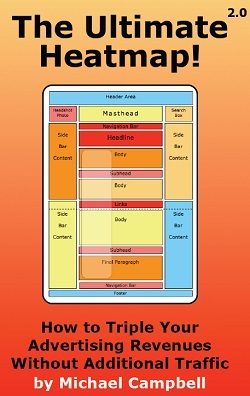 This is so my cup of tea, I started to use heatmaps ever since I heard of them from Google Adsense. Since then I started using software that records my users clicks in order to know how they behave and based on that I keep on making changes to my websites, with amazing results in some cases.